This Instant Pot Salsa Chicken Recipe is an easy recipe for Salsa Verde Chicken. This delicious instant pot recipe for Mexican shredded chicken breasts is perfect to use in salads, tacos, enchiladas, or wraps! This will be your go to Mexican Chicken recipe. I recently made Homemade Salsa Verde when my parents were here for a visit. While everyone LOVED the salsa verde, I made way too much to just enjoy with tortilla chips. I decided I would make an Instant Pot Salsa Chicken, as my mom has been requesting more Healthy Instant Pot Recipes and you all have been asking for more Instant Pot Chicken Breast Recipes. And friends, even though I am partial to my perfectly cooked Instant Pot Chicken Breasts, this shredded Mexican Chicken is SO incredibly good. There is nothing better than an easy Mexican recipe. 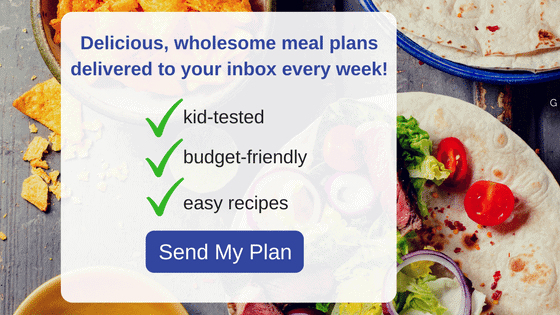 But an easy VERSATILE Mexican Recipe is a keeper for sure. 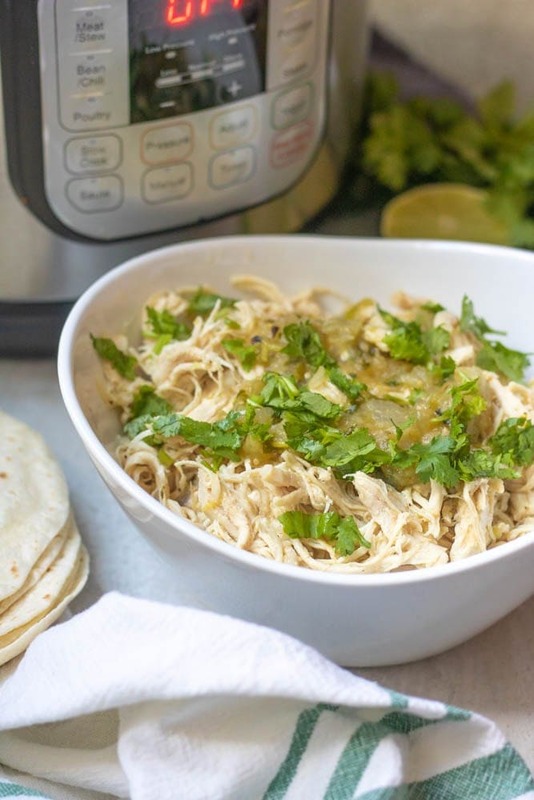 And that is EXACTLY what Instant Pot Salsa Verde Chicken is–an easy, versatile recipe for Shredded Mexican Chicken. This slightly spicy, slightly sweet, and slightly tangy shredded chicken is juicy and full of flavor and is perfect atop salads, stuffed in burritos, served in soups, or made into enchiladas. It is important to note you can use traditional red salsa in place of salsa verde–with the same delicious results! Making shredded chicken in the instant pot is SIMPLE! Period. If you want a plain shredded chicken, please refer to my Perfect Instant Pot Chicken Breast Recipe. 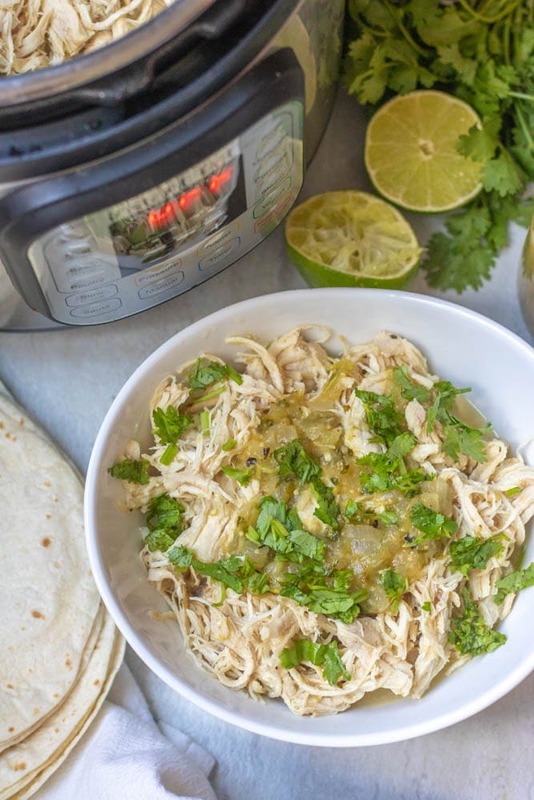 But if you are looking for a delicious Instant Pot Mexican Style Chicken, this Salsa Verde Chicken is for you! Turn your Instant Pot to the Saute function and let heat up. Add in a bit of olive oil and then add in your onions. Saute lightly and then add in the garlic. Pour in the chicken stock, salsa verde, and honey into the instant pot. Scrape the bottom of the instant pot, being sure remove any browned bits of onions or garlic from bottom of the pan. This is one reason that can cause your Instant Pot to not come to pressure or get a burn warning. 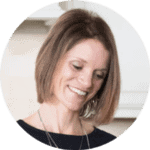 Read more about why your Instant Pot may not seal here. Submerge the chicken into the liquid and secure the lid on the pressure cooker. Step Three: Cook Chicken on High Pressure. You do not need to cook your chicken on the Poultry setting on your pressure cooker. It is just a fancy pre-set for cooking on high pressure (read more about Instant Pot Functions here). How long you cook your chicken breasts will depend on how thick they are and if they are frozen or not. Cook on high pressure for 6 minutes for small (6 ounce) chicken breasts. Cook on high pressure for 8 minutes for large (8-10 ounce) chicken breasts. Cook on high pressure for 10 minutes for small (6 ounce) chicken breasts. Cook on high pressure for 12 minutes for large (8-10 ounce) chicken breasts. Once cook time has elapsed, allow pressure to release naturally for 10 minutes. You can do a quick release after 5 minutes, but I find that after 10 minutes the chicken will shred easier, and be juicier. Shred the chicken right in the salsa liquid to keep these chicken breasts moist and juicy. Finish this Shredded Salsa Chicken with a squeeze of fresh lime juice. What is the best way to shred cook chicken? Most people shred cooked chicken with 2 forks. And that works. However, my favorite way to shred chicken is with my hand-held kitchen mixer. To shred chicken with a hand-held mixer, just place the mixer (with attachments) right into your instant pot and turn to low. Increase speed to medium, and watch your chicken shred into perfect pieces. Note: If you have a lot of liquid inside your instant pot, you may want to drain some off before shredding. It won’t necessarily shred easier, BUT it will protect you from having hot cooking liquid splash up at you. Shredded Salsa Verde Chicken is so incredibly good in so many ways. On top of a baked sweet potato. On top of a salad–try it on this Mexican Cobb Salad. In burritos, on tacos, or in Chicken Verde Enchiladas. On top of Pineapple Cilantro Rice. Because this is Salsa Verde Chicken, you want to use the BEST Salsa Verde. I prefer homemade, but a good quality jarred salsa will work as well. If you need this shredded chicken recipe to be Paleo, omit the honey and add in another sweetener of your choice, like maple syrup. You need that bit of sweetness to balance this recipe. If you use pineapple juice instead of chicken stock, you can omit the honey, as the pineapple juice will provide the sweetness Salsa Verde Chicken needs. If you have leftover Salsa Verde Chicken, freeze for up to 3 months. Defrost in the fridge and use as desired. To reheat Frozen Salsa Verde Chicken, remove frozen chicken from freezer bag or container (you may need to run under hot water before you can remove from bar or container). Place in Instant Pot on saute function for 5 minutes, breaking up lightly. Close Instant Pot lid and turn Instant Pot to high pressure for 5 -8 minutes to reheat meat perfectly. This Shredded Mexican Chicken is delicious if served with a squeeze of fresh lime juice mixed in after shredding. It really brightens up the flavor. An easy recipe for Salsa Verde Chicken. This delicious instant pot recipe for Mexican shredded chicken breasts is perfect to use in salads, tacos, enchiladas, or wraps! Turn your Instant Pot to the Saute function and let heat up. Add in a bit of olive oil and then add in your onions. Saute lightly and then add in the garlic. Saute another minute longer. Pour in the chicken stock, salsa verde, and honey into the instant pot and scrape the bottom of the instant pot, being sure remove any browned bits of onions or garlic from bottom of the pan. Submerge the chicken breasts into the liquid, season with salt and secure the lid on the pressure cooker. To make salsa verde chicken with fresh Chicken: Cook on high pressure for 6 minutes for small (6 ounce) chicken breasts, 8 minutes for large (8-10 ounce) chicken breasts. To make salsa verde chicken with frozen Chicken Breasts: Cook on high pressure for 10 minutes for small (6 ounce) chicken breasts, 12 minutes for large (8-10 ounce) chicken breasts. Once cook time has elapsed, allow pressure to release naturally for 10 minutes. You can do a quick release after 5 minutes, but I find that after 10 minutes the chicken will shred easier. Shred the chicken right in the salsa verde liquid to keep these chicken breasts moist and juicy. Mix in the juice of a fresh lime to brighten this Instant Pot Salsa Chicken. If you use pineapple juice, you can omit the honey, as the pineapple juice will provide the sweetness Salsa Verde Chicken needs. What is the serving size? I’m trying to put this in my fitbit food log. Thanks! 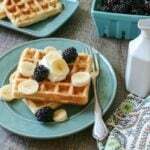 Hi Angelin, this recipe makes 8 four ounce servings. Four ounces of cooked shredded chicken with sauce is a little less than 1 cup, loosely packed. Hope that helps. This chicken was so tender and tasty! My husband who usually dislikes chicken even said it was excellent! This is a quick, easy and delicious IP recipe. I am so glad you and your husband both enjoyed! So confused. At one point in recipe story. You mention lime juice. But then in the actual recipe you mention Pineapple juice…. I am sorry for the confusion Jennifer! I will update the post to be more clear. The lime juice is optional to be added to the cooked shredded chicken to brighten the flavor. Thanks for pointing that out! I hope you enjoy!